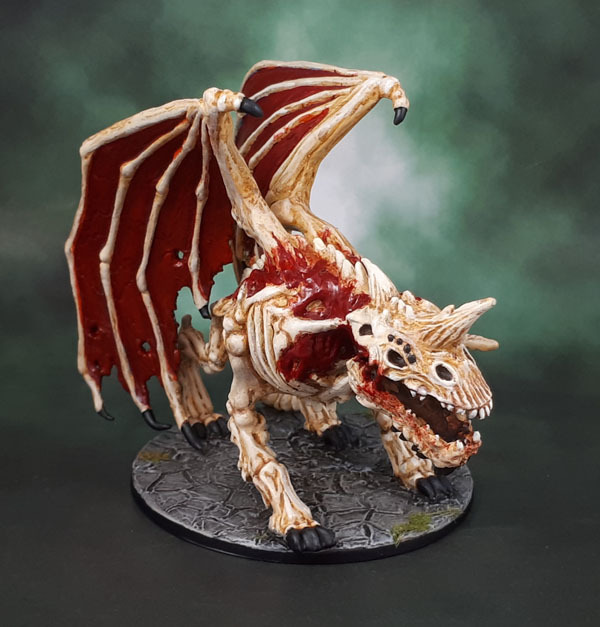 D&D Monster Manual 14: Castle Ravenloft Dracoliche (#Monstermarch3 ’19, Gender-Ambiguous March ’19) | Azazel's Bitz Box. 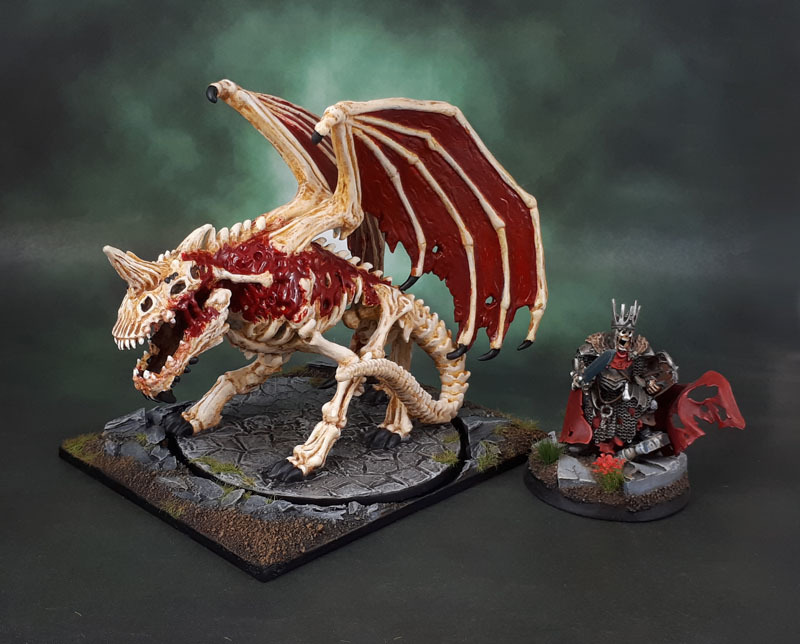 This entry was posted in Board Games, Dungeons & Dragons Monsters, Kings of War, Undead Army and tagged Castle Ravenloft Miniatures, Dungeons and Dragons Miniatures Dracoliche. Bookmark the permalink. Cheers, Alex. Another one I’m happy to have gotten off the desk! 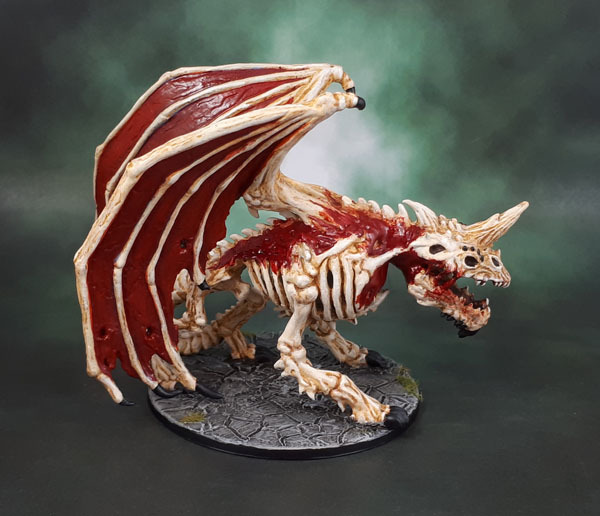 I reckon the red bits could use some more contrast, they seem a bit flat compared to the bone. Though I do understand that you don’t want to take too long with a model that you don’t care about that much.. Anyway, nice board game mini for sure! There’s a little bit there, underneath the coat of Bloof for the Blood God. The main issue with it is that there’s actually no detail to bring out besides a bit of blobbiness because PVC boardgame mini! The wings also have a small highlight int he middle, but again, they’re flat, un-detailed, and underneath a coat of Spiritstone Red! Thanks mate – not too hard these days with the increasing quality of boardgame models. A fair few of the others from this game are also quite good. Alex has got it spot on with his comment I think! Brilliant! Looks good- like the sabot base. Thanks Pete. I’ve probably got to make up a few more of those for various models sometime…. I kind of feel like if they couldn’t do better detail on the flesh, they should have just left it as all bones. Nice job with what you had to work with, tho! Well, I’m willing to cut them some slack on it based on the context of it being a boardgame model from WotC circa 2010-ish. If it were a GW kit from the same time frame, I’d think a lot harsher towards the model’s drawbacks. 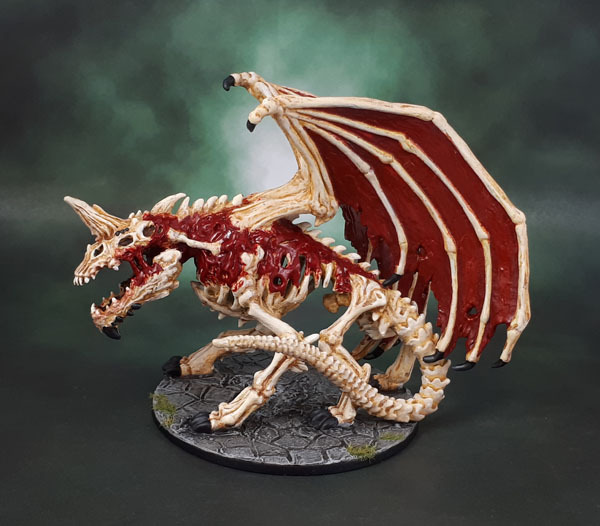 It’s a Dracolich, not a Zombie Dragon or something. There’s no particular reason for it to have any fleshy bits at all. More than happy to take your word for it, as my D&D knowledge is surface-level at best. I think the meaty bits probably provided the sculptor with an easy way to “cheat” through some of the more structurally challenging bony bits. 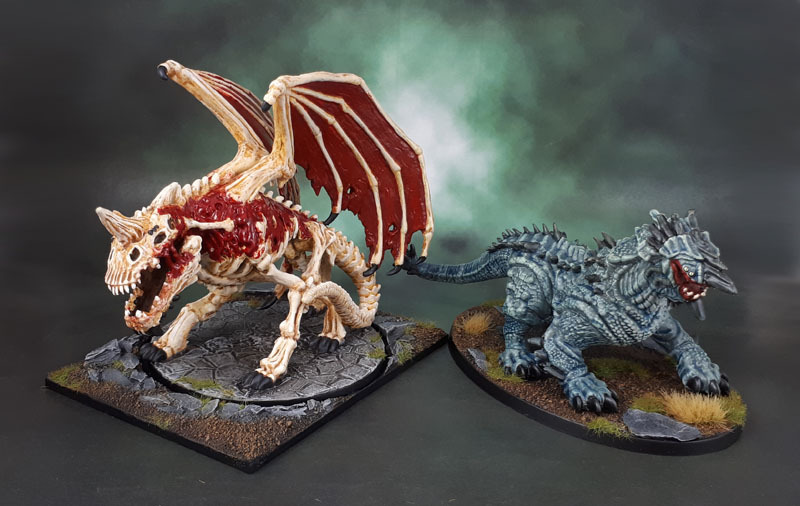 I do have the Zombie Dragon from the same set done, though. Need to do a compilation post of these critters sometime soon(ish). Liches, Draconic or otherwise, are usually just bone, and often even a significant amount of that has fallen to dust and they’re basically just held together by their magic. Eventually, enough of them dusts away that they border on being incorporeal. Great stuff! Love these monster sculpts. Thanks mate. Just one more to go for Monster March, but plenty more beyond that! Well done mate ,though Elm still chuckling over the C-bomb comment ! bloody beauty . Nice, I just snatched up this game when there was a sudden price drop. If I ever get around to painting the minis in any of those boxed games, I’ll definitely be referencing what you’ve done here. 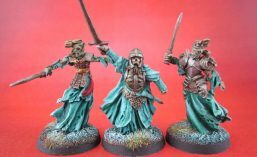 At some stage I’ll have to have a look for all of the other Ravenloft models and do a group shot post! That would be pretty sweet. Do you have all of the boxed sets to date? I think so? There’s Ravenloft, Ashardalon, DRIZZZZZZZZZZZZT, and Temple of Doo.. Elemental Evil? Tomb of Annihilation. That’s the latest one, that I still need to pick up.